Most recent update: February 19, 2017 : This page is not written for or intended for use in legal endeavors. Severe dizziness after the injury, with a temporal bone CT scan showing a fracture. Often accompanied by hearing loss or peripheral facial weakness ( Bell's Palsy). Temporal bone fractures, especially the oblique variety (see above), may impair hearing and cause dizziness. There often is blood seen behind the ear-drum (hemotympanum). 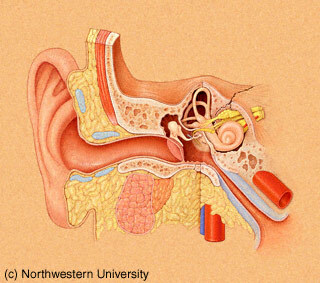 Either a conductive or sensorineural hearing loss may be present. Vestibular deficits are also common, especially in the oblique variety. Bilateral vestibular problems are exceedingly rare. Causes of fracture, gender, and symptoms are similar in adults and children (Kang et al, 2013). Diagnosis is generally through a CT scan that shows the fracture as well as blood in the mastoid sinus. Rarely air is seen in the labyrinth (pneuomlabyrinth) -- according to Choi et al, only 7% of those with otic capsule fractures (e.g. Oblique above) have air in the labyrinth. When there is air in the cochlea, there eventually is total hearing loss (Choi et al, 2016). We have seen a case in which we suspected that pneuomolabyrinth caused a positional nystagmus. This is very logical considering the biomechanics. Treatment is conservative. Prophylactic antibiotics are given, usually for 4 weeks. Myringotomy and insertion of a ventilation tube may be indicated, especially for serious otititis that persists after one month (Pulek and Deguine, 2001). Choi JW, Lyu AR, Ryu KA, Kim D, Park YH. Detection of pneumolabyrinth after temporal bone trauma using computed tomography. .Acta Otolaryngol. 2016 Jul;136(7):682-6. doi: 10.3109/00016489.2016.1157266. Epub 2016 Mar 23. Kang HM, Kim MG, Hong SM, Lee HY, Kim TH, Yeo SG.Comparison of temporal bone fractures in children and adults. Acta Otolaryngol. 2013 May;133(5):469-74. doi: 10.3109/00016489.2012.754995. Epub 2013 Jan 7.